The build is up and the designers are ready for the doors to open! 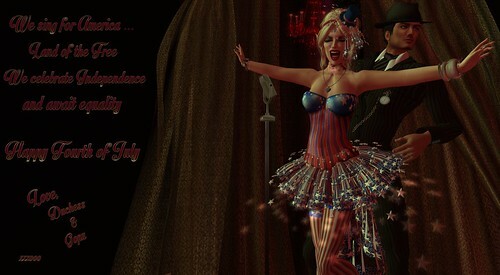 Flux has just kicked off bringing a brand new monthly theme to the grid all wrapped up in red, white and blue called “Americana!” Flux is a themed based monthly bazaar featuring exclusive content from some of Second Life’s most creative minds! This month’s theme, Americana, brings designs perfect for everyday but an absolute must have if you are celebrating the American holiday on the 4th. Gopu and I wore these amazing Grease themed outfits by Dead Dollz on a little Americana date to the carnival at The Wash. The pink ladies jacket I am wearing quickly became a favorite of customers and Dead Dollz fans leading them to beg for a T-Birds jacket to complete the set. So here you go … The exclusive T-Birds jacket you have all been waiting for… available at Flux! Grab your partner and your friends and head to Flux for some star spangled goodness! Male and Female items abound…. and some of the best crafted freebies I have seen in quite some time! My third and final entry for the the Hair Fair Photo Contest. This image was a lot of fun to put together and I think it represents Casablanca well. I am inspired by love. I am a sap for romance, love songs, surprise roses, holding hands, small boxes wrapped in clever paper, good night kisses on the forehead and hearts. I cry during romance movies….. yep, a sap. Play it again, Sam. As Time Goes By…. Casablanca. Sinatra. Enuff Said. I thought I would share one of my entries in the Hair Fair 2013 Photo Contest tonight. The deadline to enter is tonight at midnight so hurry and get your entries in! This years theme is “Movies that Inspire Me.” This entry is obviously the Fifth Element. How could the reanimated cells of an ancient wrapped up in the adorable LeeLou character not be inspirational! Leeloo single-handedly defeats several Mangalores, learns an entire language in hours and then ends up saving Earth.